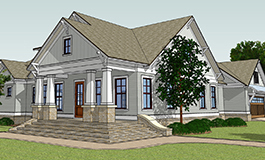 Crocker Homes is a design-build company that specializes in custom residential projects, including new homes, additions, major remodels and cabinetry builds and installations. If you’re not familiar with the term, design-build means we design and build your vision without bringing in outside architectural or construction services. It means we are all on the same team with the same goal and, should any challenges arise, we roll up our sleeves to find the best solution. We are accountable for everything—from the look of the end result, how much it costs and the timeline of completion—giving you a committed, single point of contact. Our partnership with Crocker Design Group, LLC will bring your vision to life. With over 40 years of experience and scores of satisfied homeowners, Crocker Homes is qualified and licensed to build your custom, residential property. The process begins with your first call to our office. We listen and translate your ideas onto paper and keep you involved and informed throughout the entire construction process. We know we are not just building a house, we’re building a home we want you to enjoy for years to come. Crocker Design Group, LLC is a family run company that specializes in the design of custom residential projects, including new homes, additions, remodels and interiors. Whether a small bath renovation or an entire home makeover, Crocker Homes has the skilled craftsmen for the home makeover you envision. Remodeling and renovations are more than replacing the old with new. That’s why we begin with a great design and detailed plans to transform your space. Stylish finishes complete the form and function of your plan. Working with our sister company, Fairhope Cabinetry & Millworks, Crocker Homes can provide you with custom cabinets, doors and furniture for your new space. Distinctive styles and finishes, such as antiqued, glazed and beaded, give you choices to match your personal style.